Studio, 2012. A flexible studio space and workshop are installed on the ground floor of the architects’ East Vancouver home. Lined in Douglas fir boards, the space opens like a viewfinder to the street, connecting the office to the neighbourhood and flooding the space with sunlight. North Vancouver House, 2015. Traditional materials shine in this mid-century house renovation where an 800-kilogram marble slab, hand-picked from a Vancouver Island quarry, tops off the solid ash cabinetry. The sink is carved right into the counter. Torafuku, 2015. 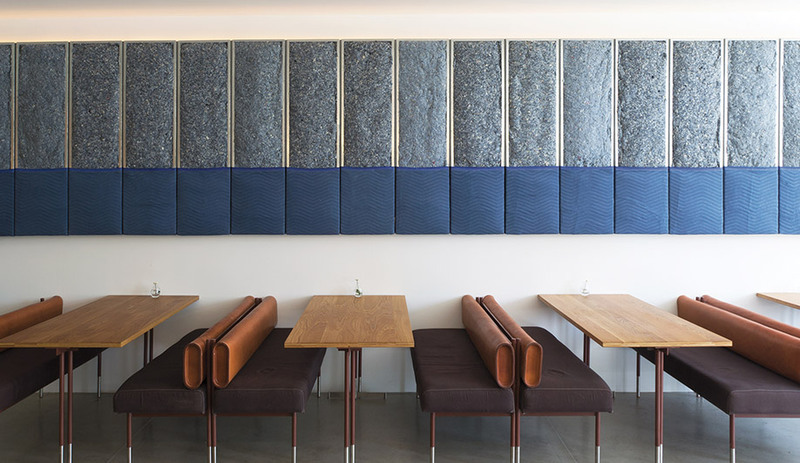 The wall feature at this pan-Asian restaurant is made of moving blankets and recycled denim, and the benches are wrapped in tarps (specified from the Princess Auto catalogue) and utility-grade leather. Mak N Ming, 2016. 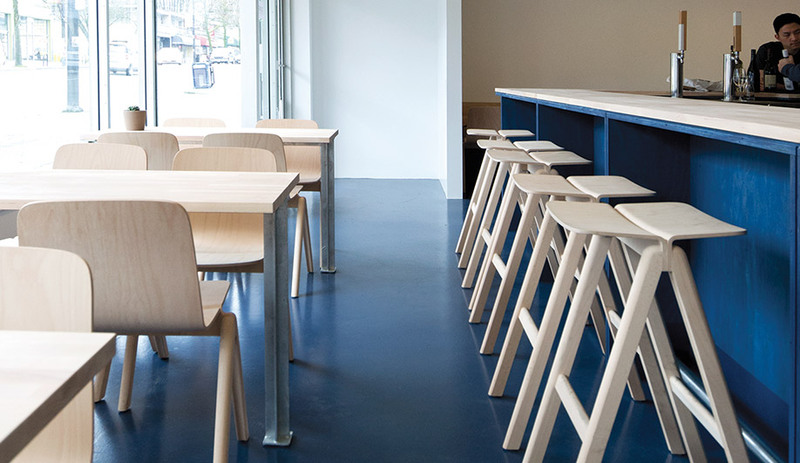 The central service table in this Vancouver restaurant required custom casters, designed to support the massive weight of the table’s marble top. The unfinished red cedar walls incorporate hidden storage. 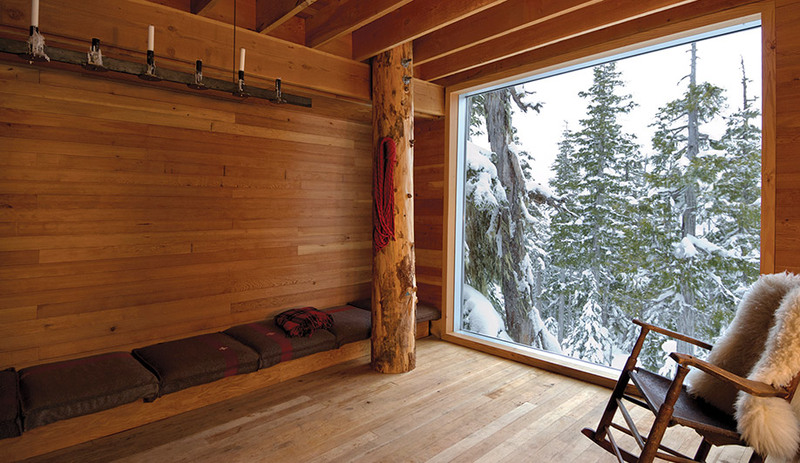 Whistler Cabin, 2015. A 178-square-metre cabin for a family of snowboarders features an internally exposed frame of locally harvested Douglas fir. The A-frame structure is banked into the site’s bedrock. Mister Ice Cream, 2016. Installed in a former loading dock, this unique shop serves up liquid-nitrogen–cooled treats. 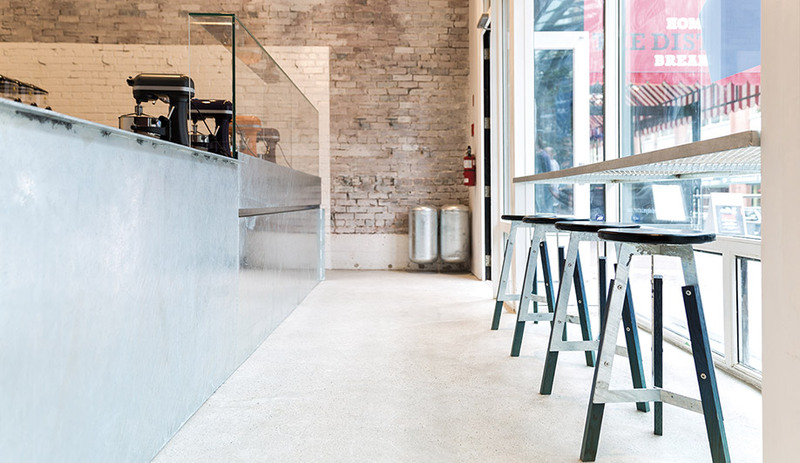 Its minimal seating area is furnished with custom wood-and-steel stools upholstered in dyed utility-grade leather. Lac Le Jeune, 2000–2016. After graduating from Dalhousie’s school of architecture in 2000, the Scotts spent the summer transforming a salvaged steel frame into a family cabin. The project has slowly come together over the years and is “almost finished,” says Susan. You might not believe that a monster truck rally helped launch one of Canada’s most subtle and meticulous young architectural practices, but it’s true. “It was at the Halifax Metro Centre,” says David Scott of his first outing with his future partner and wife, Susan. The British Columbia natives first met while studying in Nova Scotia at Dalhousie’s school of architecture. After graduating in 2000, they headed back west to put their training to use and quickly began to develop a knack for making the most of readily available materials. David’s father had salvaged the steel frame of a derelict pump house from a mine and intended to turn it into a retirement cottage. That summer, the young architects started the project on Lac le Jeune, and for the next dozen years they picked away at the cabin, eventually finishing the interior with pine salvaged after a beetle infestation felled over 100 trees on the site. 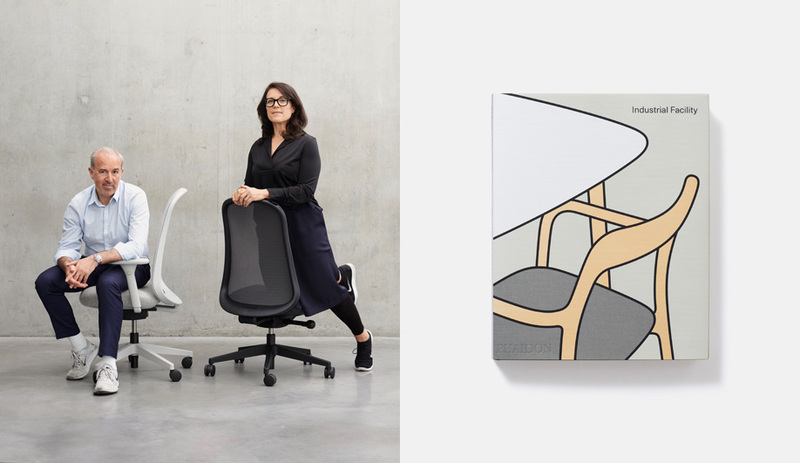 All the while the couple worked at some of Vancouver’s most significant firms: Susan at James K.M. Cheng Architects and later with McFarlane Green Biggar Architects + Designers; David at Peter Cardew Architects. 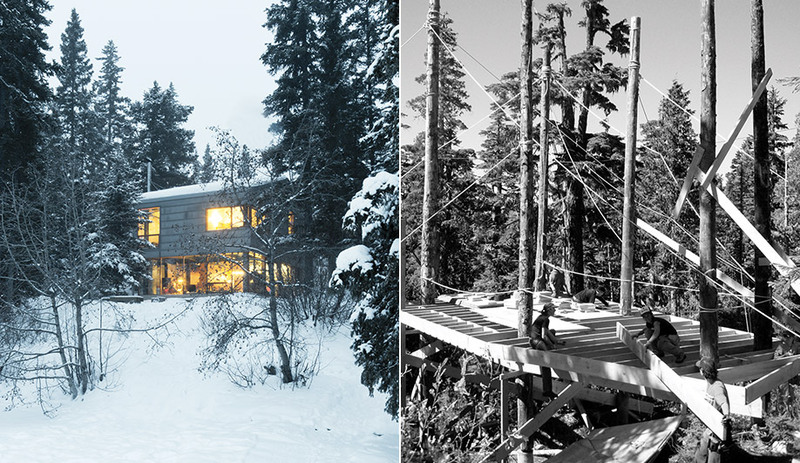 Alpine Cabin, 2006–2012. 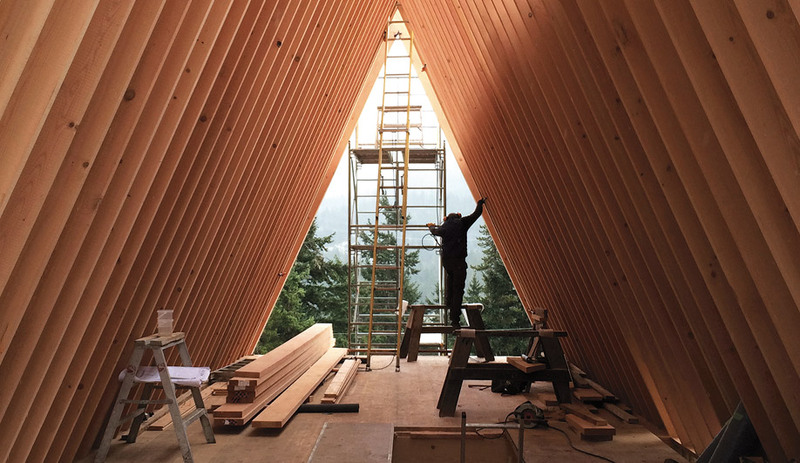 The couple’s own cabin on Vancouver Island was self-built with the help of friends over a six-year period. Its defining feature is a series of log columns that run from below the floor plate up through the interior. In 2006, they started work on a cabin for themselves, unaware that when it was completed six years later it would be the first project billed under the name Scott & Scott Architects. Inspired by a nearby utility pole manufacturer, they framed the cabin around six raw wood columns (planted in Sonotube bases) that run straight through the interior. 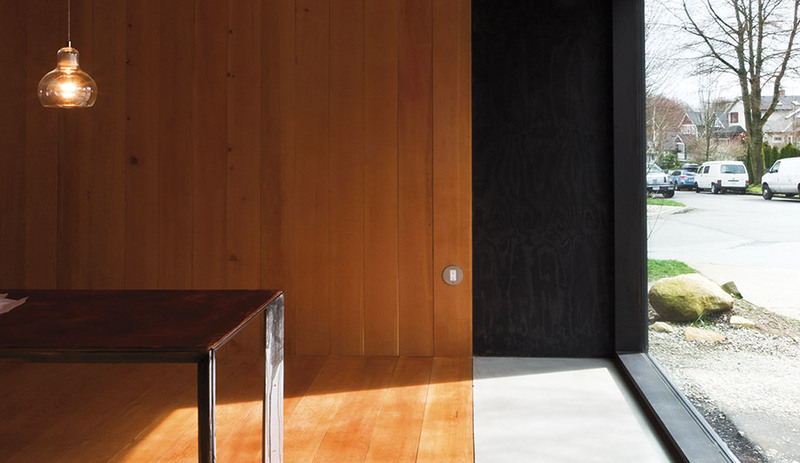 Similar to the Lac le Jeune cabin, this DIY project combines a meticulous, restrained approach with locally available materials to achieve an aesthetic that evokes the charismatic minimalism of spaces by John Pawson or Brian MacKay-Lyons. It was the couple’s children that finally launched their firm, says Susan. “After two kids, we were looking at child care, and we needed to renovate our house. Rather than paying for it all, we decided to just do everything ourselves.” The 2012 reno added a studio and an industrial design workshop to the main floor of their East Vancouver home; meanwhile, two commissions came along: transforming a timber frame into a multi-use barn for a Gulf Island farm, and inserting a 25-seat eatery called Bestie into a tiny storefront in Vancouver’s Chinatown. 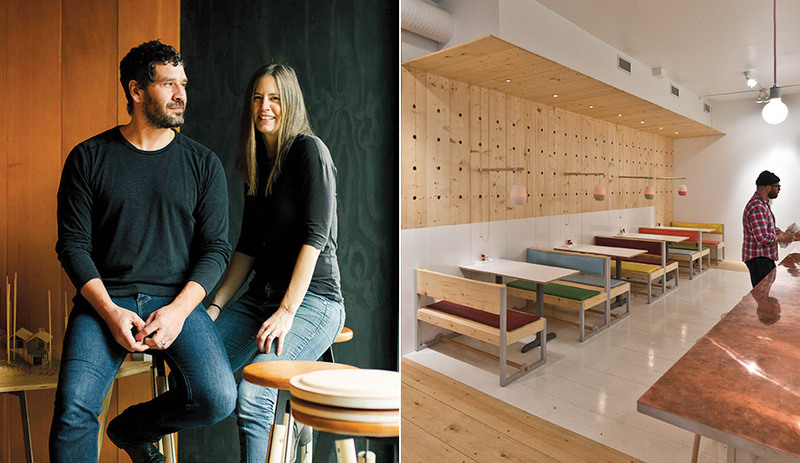 The beer-and-sausage joint, with its warm, unpretentious interior, made an ideal public debut for Scott & Scott Architects in June 2013. Bestie Currywurst, 2013. This beer-and-sausage joint is filled with the functional detailing and simple materials that the Scotts are known for. A wall panelled in economy-grade spruce is styled as a large-scale pegboard that accommodates hanging lamps and even art shows. 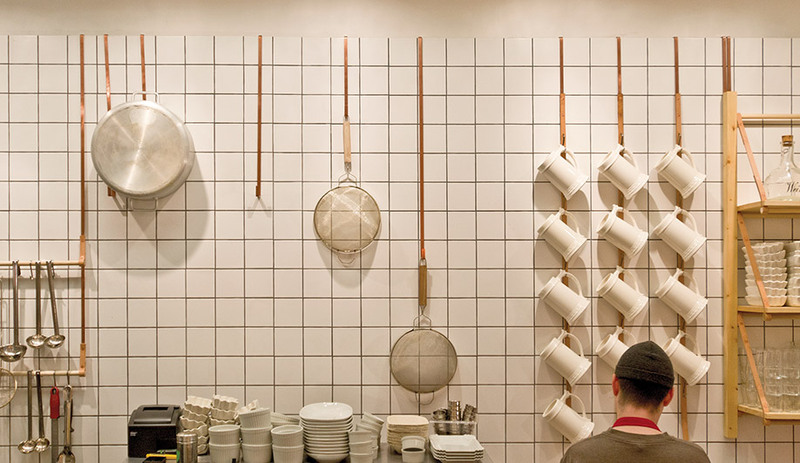 It mirrors the kitchen storage wall opposite, which features custom copper hardware. In order to build such lasting spaces, Scott & Scott Architects rely on a select material palette of wood, concrete, metal, leather and traditional finishes that are meant to endure. By repeatedly using these elements, the pair continually gain a better understanding of how the materials work. And with this understanding comes a slow and steady evolution. Though utility informs aesthetics in the firm’s design process, the results are nonetheless exquisite. 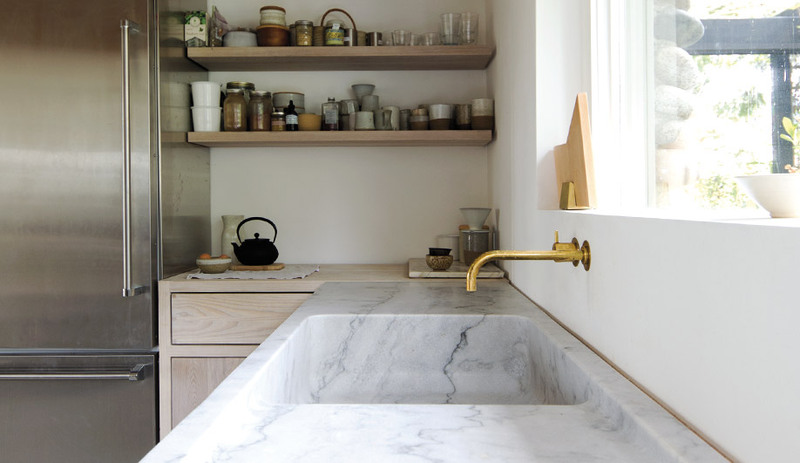 Raw materials are used in unexpected ways: in a North Vancouver house renovation, for instance, the kitchen sink is carved into a monolithic countertop, formed from an 800-kilogram slab of marble. Kin Kao, 2015. 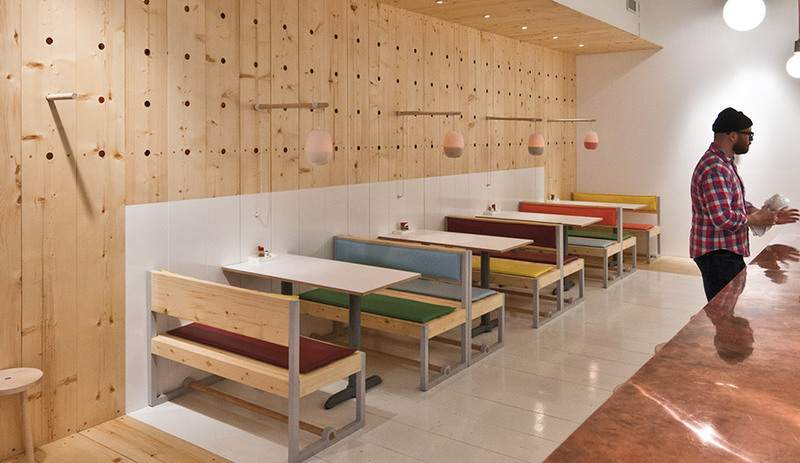 Function dictates form at this 25-seat eatery located in a strip mall. The materials – galvanized steel, soaped beech, and plywood – are economical and meant to age well. The Scotts fabricated the furniture and lights, including the sculptural dowel lights that were revisited for the couple’s next restaurant project, Torafuku. Similar restraint is found in the use of that most ubiquitous of Canadian materials: wood. Bestie is wrapped in an economy-grade spruce; the interior of the Scotts’ studio is clad in Douglas fir, oiled and stained black; and inside the firm’s second resto, Kin Kao, the same species appears as blue-tinted plywood. 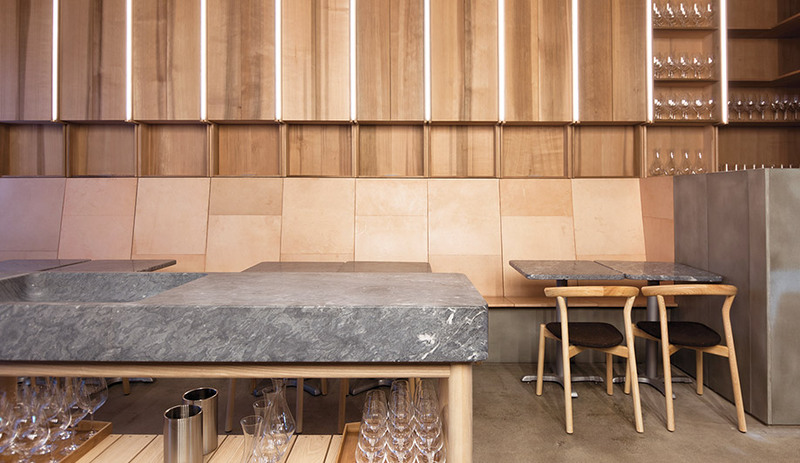 Concrete, used subtly in the Scotts’ earliest works, moves to a starring role in the kitchen at Whistler Cabin and as an impressive formwork table at Torafuku. The materials can be “slightly scrappy,” says David, but they’re economical, locally sourced and meant to age well. “Our intent is that our projects wear and become more familiar, like jeans or a leather jacket,” he says. The firm appears to be wearing well, too; last spring the Scotts were announced as the recipients of the Royal Architectural Institute of Canada’s Young Architect Award.